There is no any evidence of interactions of Varumin® with chemotherapy or other oncology treatment. Combination therapy is usually desirable, because cancer treatment always needs to be aggressive, in order to stop the malignant cell proliferation and tissue destruction. Varumin® is a herbal anticancer product, and can produce improved efficiency when is used with chemotherapy. Even, it is noticed that usual adverse reactions, which are following the standard chemotherapy, can be avoided. In less than 1 hour, after taking the first dose of Varumin®, its effects are becoming noticeable. After the first month of using Varumin®, there are cases where there is no more need of radiation therapy, because the recession of the tumorous mass. Manufacturer of Varumin® strongly recommends fast and in time beginning with the therapy with Varumin®, for achieving best results. Why cancer treatment should begin immediately after diagnosis? Cancer is serious disease, and if not treated can lead to death in a small period of time. Additional problems are caused if it becomes metastatic. Standard therapy against cancer is normal in this cases, and also additional treatments, like with Varumin® should be provided for improving the expectation and results. The producer recommends beginning of the therapy with Varumin® as soon as possible. 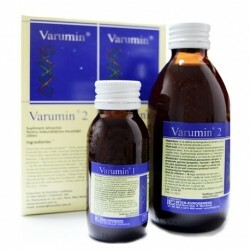 Varumin® is an herbal medicinal product, consisted strictly of active ingredients from herbal origin. The action of Varumin® is primarily anti-cancer. It improves general condition of the body. What is the proof that Varumin® works? For Varumin® we have reports made from expert Prof. Dr. sci. Sibin Ilic, Macedonian clinical center in Skopje, Clinical center in Bitola, a number of doctors from different countries, and thousands of satisfied customers. Varumin® has been delivered to almost all countries in the world, for over 20 years. Which types of cancer can be treated with Varumin®? The best results are obtained when Varumin® is used on soft tissues (e.g. lung cancer, prostate cancer, breast cancer and digestive organs cancer), but we have documented cases of total healing of all types of cancer. Can I use Varumin® during chemotherapy or radiotherapy? Yes. There is no point of interaction between these therapies. Only better and improved results can be expected. In which other conditions, except cancer, can I use Varumin®? When the organism is exhausted (due to different etiology), for improving resistance of organism, as adjuvant in standard therapy of some acute and chronic diseases, anemia, multiple sclerosis, alterations in immunity and bad general condition. Can I use Varumin® with other medications or herbal products? Yes. Only you should beware of use if you are hypersensitive to some of the components of Varumin®. What are the recommended doses of Varumin®? Every treatment starts with drinking whole bottle of Varumin® 1. Six hours later, take one soup spoon (10 ml) of Varumin® 2. One soup spoon of Varumin® 2 should be taken 4 times daily (this does not mean strictly, every 6 hours). If this normal schedule is used, the whole box of Varumin® should be spent in around 5 days. In case of bone tumors, tumors located in head, and highly metastasized types of cancer, Varumin® should be taken up to 5 times a day. Children can take Varumin® 3 times a day. Patients after one month of therapy, if the results of cancer suppression are good, can continue with lower doses of Varumin®, like 3 times a day. Later on, when the condition of the patient is stabilized, the dosage can be lowered or the time interval between two doses of Varumin® can be increased (instead of every six hours, it can be taken on every eight or twelve hours). The first results of cancer suppression can be expected after 4 weeks of use (analogue to 6 boxes of Varumin®). If there is an improvement of patients’ general state, or improvement of blood tests, treatment with Varumin® should continue up to six months. After this treatment it is not necessary, but is desirable to take 1-2 doses yearly. Can I have a meal between treatment with Varumin® 1 and Varumin® 2? Yes, of course. Important is to take the first spoon of Varumin® 2 six hours after taking Varumin® 1, and this to be done one hour before meal. Is it advisable to use other herbal preparations during the treatment? Yes. We advice using Varumin® herbal – herbal tea, which can be used as drink during the whole time of therapy, because the components which are included in it, have non-specific immuno-stimulative action. 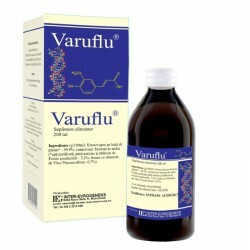 Pour one spoon of Varumin herbal® herbal tea with 250 ml cold water and boil it. Steer for 2 hours in a covered pot. Drink prepared tea three times daily. What should I do if case of diarrhea? In case of heavy diarrhea, try with lowering the dose of Varumin®. This condition could happen if you are using Varumin® 2 four times a day at the same time with other preparations that contain aloe. In thi case you should stop using other preparations that contain aloe. FAQ There are no products in this category.